Colchester is one of the oldest towns in Britain, and boasts a wealth of delightful attractions such as The Mercury Theatre, Gosbecks Architectural Park and even the remnants of the Temple of Claudius. Fascinating and rich as Colchester’s history may be, at Ricky TylerLandscapes we believe it’s the beautifully well maintained gardens that help make this former Roman capital so special. Perhaps it no surprise then that we are dedicated to offering both commercial and residential grounds maintenance in Colchester and its surrounding areas including Great Tey, Hardy’s Green, and Layer Marney. So if you live or work locally and want a fantastic service from a team passionate about the area, there’s nobody better placed than Ricky Tyler Landscapes to help bring all your gardening and landscaping needs to life. To begin with, we offer a whole host of business and commercial services including grounds maintenance, playing field grass cutting, and commercial landscaping. Our extensive experience in the area means we have helped a wide variety of local concerns from schools and businesses, to landlords and local authorities – we never fail to ensure prices stay low and our loyal customers end up truly satisfied. Moreover, we always top any genuine quotes, and deliver gorgeous results cheaply and in rapid time. Ultimately, At Ricky TylerLandscapes, our comprehensive attention to detail means you’re sure to love the results every time. 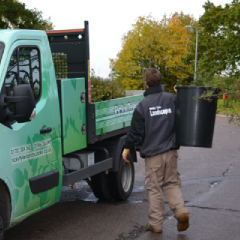 So whether it’s commercial landscaping you require, or grounds maintenance and other services such as tree works, facility services, and fencing in Colchester – Ricky Tyler Landscapes has the team for you. Ricky Tyler Landscapes doesn’t just deal with commercial needs. We are also dedicated to providing a complete residential and domestic landscaping service to help you realise your landscaping dreams for your home. No matter if it’s just a bit of basic garden maintenance you’re after, or full-service lawn care and turfing, or perhaps even driveway and patio refurbishment – Ricky Tyler Landscapes has the solutions you need. In our ten years in the business, we’ve amassed over 1,500 happy customers in Colchester and neighbouring districts such as Elmstead, Langham, and Ardleigh. We pride ourselves on an approach that’s entirely designed to the needs of you and your family. We offer weekly, fortnightly, or monthly service plans which are perfectly suited to your specifications. We make your space incredible, but are also flexible enough to let you enjoy your garden whenever you feel like it. So if it’s garden maintenance, lawn care and turfing, or even fencing and spraying in Colchester and beyond that you’re after – let Ricky Tyler Landscapes take care of it for you. Ricky Tyler Landscapes can provide gardening and grounds maintenance services including Colchester Grounds Maintenance covering Colchester, Essex .